Prototype: German Federal Railroad (DB) class 420 S-Bahn powered rail car train. The train looks as it did around 1990. Version in an orange / "Gravel Gray" paint scheme for the S-Bahn network in the greater Munich area. Model: The train has a DCC/mfx digital decoder and extensive sound functions. It also has a 5-pole skewed armature motor with a flywheel, centrally mounted. Four axles on the intermediate car are powered through cardan shafts. The frame for the intermediate car is constructed of die-cast metal. Maintenance-free warm white LEDs are used for the lighting. The train has triple headlights and dual red marker lights that change over with the direction of travel. The end cars have a pickup shoe changeover feature so that the pickup shoe at the front of the train is the one picking up power. Lighted destination signs along with the headlights / marker lights can be controlled digitally. 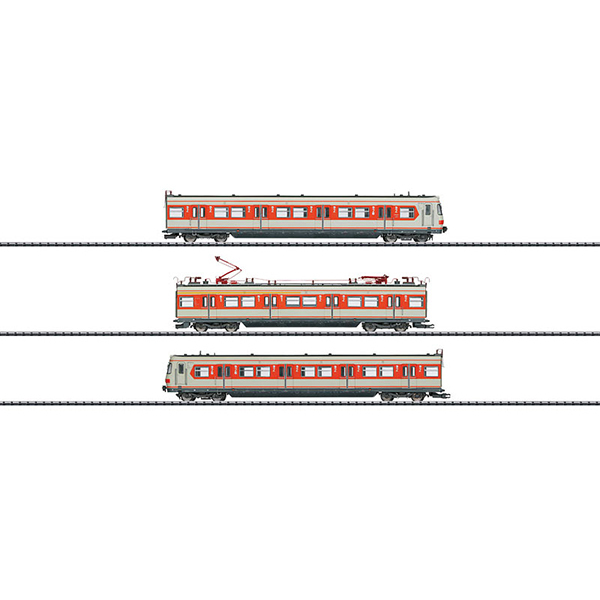 There is a close coupler guide mechanism and electrical connections between the cars. The special coupling included with the train allows it to be coupled to other ET 420 units for prototypical operation. The train has factory-installed interior lighting. Different authentic destination signage for the Munich S-Bahn network is included with the train. The bodies for the train are made of highly detailed plastic with many separately applied details such as grab irons, electrical connections, windshield wipers, antennas, whistles, and horns. The train has interior details. The ends of the train have a detailed representation of the Scharfenberg coupler (a dummy coupler). Length over the couplers 77.5 cm / 30-1/2".